I may not make a lot of jewelry but I sure do buy a lot of beads. Sad but true. I'm working on that. But when I do buy I shop around, looking for the best deals. My last major purchase was a whole lot of Miyuki Delicas. Those babies are not cheap anywhere but when I look at those tiny tubes of glass I totally understand that. They are amazing. And come in hundreds of colors. I want them all! So I built an Excel spreadsheet of prices of Delicas. There are about 25 online bead sources on that list along with their Delica prices. And you know what? The cheapest was Fire Mountain. Even though I wasn't all that surprised, I had hoped to discover some little unknown shop that would beat them. No such luck. 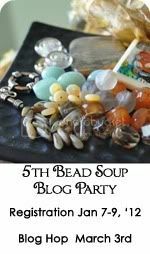 But now there's a way you can get Fire Mountain beads for even less than their already low prices: Jet Beads is a new service that is so wonderful that I decided to dedicate my 2nd blog post to them! I am a large wholesale buyer of Fire Mountain Gems product which means I am able to purchase anything and everything they sell at the super-low discounted 200+ pricing level. In other words I pay less than half the every day prices and leverage this to sell to other potential Fire Mountain customers at a steep discount. This allows me to offer you the ability to buy at a much lower price then you could on your own and still have the order shipped straight to you from the Fire Mountain warehouse. Pick out what you want from the Fire Mountain website but instead of placing that item in the shopping cart, put it in a Wish List. Click the boxes at the top of the Wish List that enable others to see that list. When you're done, go to Jet Beads and follow their simple instructions. How awesome is that? If you want more than 200, there's a further discount (but I haven't gone that far out yet). I'm on a budget, money's tight, the economy stinks, and here is this bright little spot in my beading world that helps me so much. I can't begin to tell you how much I love this service. Jason is great to work with and provides terrific customer service. Orders are shipped directly to me from Fire Mountain and seem to arrive more quickly than when I used to place orders on their website. And in case you're wondering, this is all on the up & up with Fire Mountain. There aren't enough situations that are win-win in this world, but this is one of them. No, I'm not being paid for this shameless advertorial. I just am finding that lots of people don't know about the service Jet Beads provides, people who would probably love it as I do. Sharing the goodness... that's all. Wow amazing thanks for the tip! wow! Thanks so much for the info. I love fire moutain, and love delicas, but I'v never been able to place an order large enough to get the 200 discount. I found Jet Beads through Twitter a while back, but I haven't used it yet. I will keep it in mind, though! This is just amazing... A really clever entrepreneur. Thanx for the info!!! Hi Wild Sally!! & welcome to the blogosphere, your off to a great start with some wonderful tips, i look forward to following yout blog! Sally, you are a great bargain shopper! Thanks for sharing this info. really like the colorful bead photo at beginning of post. Almost Precious: You give me way more credit than a brand new blog with 20 followers deserves. I don't have the power to put anyone out of business. But the owner of Jet Beads is an individual, just like yourself, with his own idea for his own business. Whether it's successful or not is up to the marketplace and how he promotes his busines, just as it is with your own business. I assume you shop for good prices, too. Who doesn't these days? I'm on a fixed income and must get the most bang for my buck. I will shop where I can do that. And will help others do the same thing if I can, in some small way, do that. Hey now this is a great post. Thanks for this information Sally! Very very Intresting! Would you consider listing the other places you researched? There is one I buy from and I am interested to know if she made your list.